Techniques for adding attributes to “Locations” are similar to the techniques for adding attributes to all items on YME. * ) Item types marked with *) must be included in the official item name. For unmarked items, this is not mandatory, but still preferrable. See also section 3.1.3.1.1.3. Furthermore, you don't have to enter the value for some or all attributes of certain types of items. For example, dog parks may not have addresses, emails, or websites. 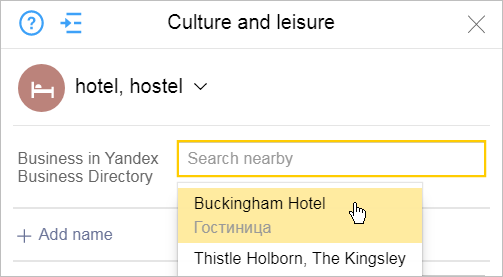 The “Business in Yandex Business Directory” attribute is there to connect the organization on the map to its listing in the Business Directory. When you fill in this field, a list of organizations opens (that are of the same type as the new item: if we add a “Shopping, book store, stationery” item, then the list will only suggest book stores). The suggestions are located within a radius of approximately 400 meters from the placemark you drew and are already registered in the Yandex Business Directory. 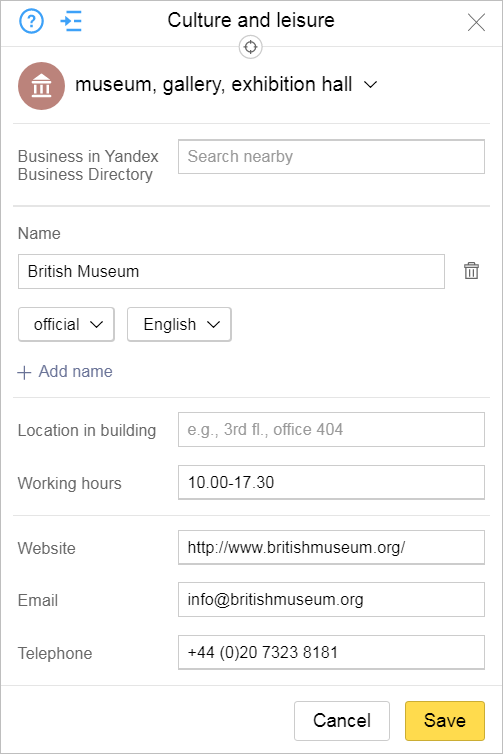 If the organization you need is in the list, select it to pull its information from the Yandex Business Directory. After you link to an organization from the directory, make sure that the attribute values entered correspond to the Yandex Map Editor rules and, if necessary, edit incorrectly entered values or add missing attributes. 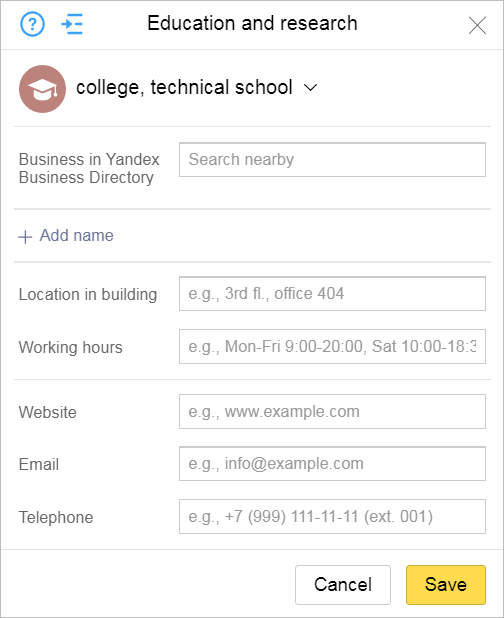 If the organization you are looking for is not in the list (which means it's not registered in the Yandex Business Directory), you can either leave that field blank or go to the Yandex Business Directory and add the organization to it. The Category attribute lets you provide a more detailed description of what business an organization is involved in. This connects the organization's line of business with the category in Yandex Business Directory. To enter a category, click on the Category field and select the appropriate value from the drop-down list. If you can't determine what an organization's main line of business is, try getting as close as possible and entering one of two suitable categories. For example: Adidas Originals clothing and shoe store, category“5.19.12. Clothing store”. See the Location and organization classification scheme appendix for more information about categories. Items are named in accordance with the general rules, see 3.1.3. Map item naming rules. When naming organizations, preference is given to brand names (as well as names on signage or those that refer to the organization's specialization (for example, Construction materials). Only use the organization's registered name if you can not locate the name sources listed above. Also see point. 3.6.1.5 — drawing and naming items under construction. If a the registered name and brand name are both known, then enter the brand name as the official name and enter the registered name in the “also known as, historical” field. For example: official name — Magnit Supermarket, caption name — Magnit, “also known as, historical” — АО Тандер. If you only know the registered name and there is no brand name or name on the organization's signage, then enter the registered name as the official name and indicate what type of legal entity it is. For the caption, enter the registered name without indicating the type of legal entity. For example: official name Teplo, LLC, name for caption Teplo. If a the organization's legal entity is sole proprietor, then enter the organization's specialization for the official name and the registered name for the “also known as, historical” field. For example: official name — Khoztovar, “also known as, historical” — A.A. Ivanov, sole proprietor. If you only know the registered name and specialization of the organization, then enter the specialization as the official name and the registered name for the “also known as, historical” field. For example: official name — Stroimaterialy, “also known as, historical” — Stroidom, LLC. If an organization doesn't have a proper name or a specific business category and is only identified by its specialization, then enter the specialization for the official name. For example: Shoe repair, locksmith, zipper repair. If an organization has several specializations that can't all fit into the official name field (for example, if the list includes three or more types of services), then use a general term to describe them all. For example: Repair shop. Names of items can't be written in all capital letters, even if they are written this way in their articles of incorporation. For example, you should enter the company VOLNA as Volna. If an organization separates the components of a portmanteau using capital letters, then you can write its name on the map using that format. For example: ElektroSetServis, StroiMashServis, Krasnoe&Beloe. The spelling of words in organizations' proper names should conform with norms of the language you are using. For example, in English the names of organizations are spelled with every word uppercase. This contrasts with Russian names, which are written with only the first word capitalized. For example: Burger King, Shaggy Dog. If the organization name was an acronym initially, but then started being used as a proper name later, then write it as a proper name (i.e. with an initial capital letter and then all lowercase). For example: Ikea, Spar, Obi. for signature: the name of the child organization. You can not enter several names for the same item that belong to different organizations (see also point 3.6.1.4). 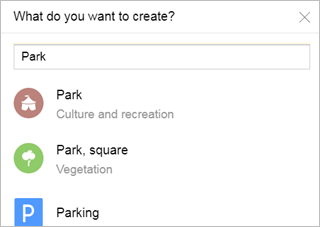 Instead, create a separate item (location) for each organization. If a place of interest has different names on an area and in the official registers, then as a type of name “official” a valid object name is set, but an incorrect name is set as a type name “synonym”. If authentic, both the name of the object, you must create two objects of the category “Places” with different type names “official”. If several organizations share the same name, territory, and subcategory (e.g. factories and industrial enterprises), please include their abbreviated item type in the official name. Enter information that specifies the organization's location within the building. For example: “4th fl., office 404”. To indicate that an organization, store, or enterprise has stopped operating. This lets moderators and cartographers know that they should delete the item from the map. To indicate that a place no longer operates but its infrastructure still exists and helps people navigate the area (for example, a closed cinema). Don't enter working hours for places or organizations that are closed or under construction. Enter the days of the week and times when the business or organization is open (if you don't know the store's hours, just enter the days when it's open). If an organization is open every day from Monday through Friday, then it's better to enter “weekdays”. If it's only open on weekends, then enter “weekends”, and if it's open every day — “daily”. For example: weekdays 9 am-8 pm (lunch 12 -1 pm), weekends 24-hours. If you do enter the opening hours, you must enter them for every working day. If an organization stays open “until the last customer leaves”, you can write 9:00-last customer for the format. If an organization works at different hours for different clients (for example, a bank may have a schedule for servicing individuals that differs from that for legal entities), then enter the working hours for the various groups of customers one after the other (separated by a comma). For example: individuals: weekdays 9:30-19:00, Sat 9:30-14:30; legal entities: Mon-Thu 9:30-17:30, Fri 9:30-16:30. You should also indicate if an organization is open “around the clock” (don't write 0.00-24.00). For example: weekdays 9:00-20:00 (break for lunch 12:00-13:00), around the clock on weekends, or around the clock every day. You can enter website addresses with or without the “http://” part. For example: www.example.com. You can not enter addresses that don't relate to the item itself in the “Site” field (for example, the address of the map item's author). You must enter the organization's email address in the “Email address” field. You can not enter an email that doesn't relate to the item itself in the “Email address” field (for example, the email address of the map item's author). If necessary, you can add an extension to the number. For example: +7 (495) 222-22-22 (ext. 001). If necessary, you can also clarify who the number belongs to. For example: +7 (383) 123-45-66 (accounting). You can not enter a number that doesn't relate to the item itself in the “Telephone” field (such as the author of the map item's number.